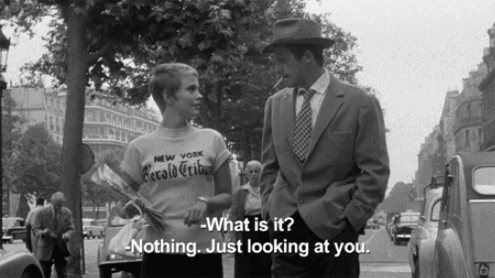 Jean-Luc Godard, the director of À Bout de Souffle, always sought to encourage the audience to rethink what film could be in terms of both subject matter and the treatment of that subject matter. Godard once commented that ‘To me style is just the outside of content and content the inside of style; like the outside and inside of the human body both go together, they cannot be separated.’ . It’s surely one of the most useful definitions that we can hold in our minds when we are studying film. A key stylistic device of À Bout de Souffle is its use of jump cuts. The jump cuts are quite different to the usually transparent style of editing used in so much cinema. Godard wants us to notice that film is a construction. Furthermore this jump cut style breaks the conventions of the organization of movie narratives. Importantly, the film does not use artificial lighting to enhance its visual style.